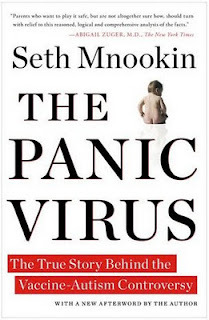 Seth Mnookin's book The Panic Virus: A True Story of Medicine, Science, and Fear is a smart, compassionate, detailed history of vaccine misinformation and distrust. It's being re-released in paperback tomorrow, with a new cover, a more direct subtitle, and a new afterword. TPGA editor Shannon Rosa talked with Seth last year about the motivation and goals behind The Panic Virus; she spoke with him again last week about his book's intended audience; the critical and oft-misconstrued distinctions between vaccine court rulings and scientific proof; the frequently misunderstood role of vaccine reporting and compensation programs like VAERS and NVICP; and how pediatricians, OB/GYNs, and parents themselves can all contribute towards improved -- and best -- vaccine information practices. How are you feeling about the impact your book has had, with respect to your original goals? Are you reaching the folks you hope to reach? 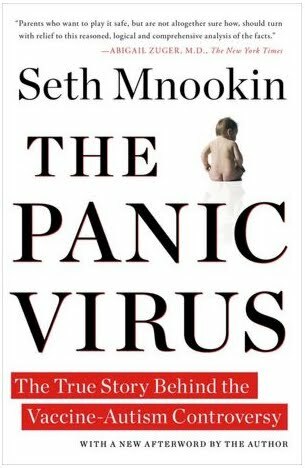 People who are aware of these issues [public perceptions of vaccines] are definitely aware of the book. But in some ways, those are the least important people in terms of what I'm trying to accomplish. Talking specifically about the autism-vaccine connection, if you were up on that issue before my book came out, I think you probably already decided where you stood, and I think it's unlikely that my book was going to change your thinking on that. And I understand that. The vast majority of parents in the country -- young parents or parents to be -- aren't in that place, weren't already really involved in this issue. Yet in terms of how I can be a positive force in the world, those are the people I want to try to reach. What's tricky is that it's very easy to get caught up in the echo chamber of just hearing from people who already knew about this issue -- or any issue that someone's writing about. In some ways it's the people who are not going to comment on my blog, people who are not going to retweet me or Facebook fan me who are most relevant to the conversation. But when you're going around your day-to-day life, it's very easy to lose sight of the fact that the people who are commenting on your site and engaging with you on social media are a very small percentage of who's out there. Have the social media dynamics of The Panic Virus's first year been a case study for the journalism classes you teach? I talk about The Panic Virus a lot in terms of pitfalls and problems to be aware of in controversy, but in terms of the benefits of different strategies in trying to find readers, I haven't really dissected that. You have always been very compassionate about understanding the motivations of people who buy into the kind of misinformation your book is addressing. Has this changed at all in the past year? I try to force myself to be aware that the people I hear form, and the people who engage with me who are active proponents of the vaccine-autism link are not representative of that population. And it would be a huge mistake on my part to equate the type of invective that I'm sometimes subjected to, to assume that that is how most of that population is thinking. An example: I recently spoke at a medical research conference -- via Skype as my daughter had just been born -- and there was someone in the audience who was very vocally anti-vaccine, and who ended being taken out of the room for something I had nothing to do with, and in fact I probably would have preferred that he stayed -- but regardless, that was an upsetting incident to me. But, I also got an email from a parent who was in that [same conference's] crowd -- not specifically because she wanted to harangue me but because she is an epidemiologist who happened to be at this conference -- who believes her child was vaccine-injured. She wrote to me and said that she thought that I should display more compassion when I'm talking about parents like her, which actually surprised me because in general it's something I try to be very conscious of. We had a several-email back-and-forth that was very involved and detailed. I know I'm not going to convince her of my perspective and I think she knows she's not going to convince me of hers, but we ended saying -- I believe very genuinely -- that if we're ever at the same conference in the future, we'd like a chance to sit down and say hello and introduce ourselves. So I need to remember that she is probably more representative of people who disagree with me on a whole. So, yeah, it's been a challenge but probably a good one for me. Another thing I've become more practiced at: whenever I write something because I'm worked up, I write and then table it, at least for a day. It's a hard thing to do because your instinct, especially when you're engaged online, is to get everything out there -- to be part of the conversation, speed is good, etc. But I would rather be slow to the conversation than write or say something not really dictated by what I actually thought or felt but dictated by my being upset over criticism, or whatever. There's probably two dozen pieces I've written over the last year that will forever languish in a folder on my computer and never see the light of day -- because they shouldn't see the light of day. They helped me get less upset, and that's that. Would you be wiling to talk about some specific vaccine issues covered in The Panic Virus, especially regarding how VAERS (Vaccine Adverse Event Reporting System) and NVICP (National Vaccine Injury Compensation Program) work? We get a lot of comments on our site and our Facebook page from people who misunderstand how they work, and invoke them as proof of vaccine-autism causation. It's really tricky and complicated. Albert Einstein said, "If you can't explain it simply, you don't understand it well enough," but I think VAERS and NVICP show that this isn't a universal truism. I don't think there's any way to give a one or two sentence explanation. I think what people don't understand about VAERS is that there's a difference between something being reported, and something being causally connected. I mean, it says in big print at the top of the VAERS reporting page, "Please report all significant adverse events that occur after vaccination of adults and children, even if you are not sure whether the vaccine caused the adverse event." I think there are an enormous number of reactions that are underreported just because they don't rise to the level of someone thinking they should report them, like rashes after the MMR vaccine, or fevers. And by the same token, there are an enormous number of reactions that are reported that are not actually related to the vaccination, or vaccine event. I know one pediatrician who had an infant have a febrile seizure in her office right before a vaccination, I've had plenty of doctors tell me stories about a child who had to change their appointments from a Wednesday to a Thursday, and then something happened Wednesday night -- a fever, or a rash, or something. I have a two-year-old and a newborn, and something's always going wrong with them. They're constantly sick, or seeing the doctor. Another thing people don't understand about VAERS is that it is designed to cast as wide a net as possible in an effort to then identify which of those reported reactions are potentially connected to vaccination -- because they need as robust a data set as possible to draw their conclusions. It is not designed to be a way of saying "If A, then B." What you've seen over the last decade or so is that lot of things that parents have gotten very concerned and very anxious about are cropping up more frequently, because parents are more conscious of them, and more likely to be looking out for them, and reporting them. About the Injury Compensation Fund (NVICP) you have a similar but not entirely parallel issue. The similarity is that the injury compensation fund is not designed to determine whether [table injuries] are connected to a vaccination event; it's designed to be as generous to families as possible. And I think that makes sense, I think that's a good way to run the program. But that means there are cases in which a payment is given out -- and that does not mean the incident was caused by a vaccine or that there's any connection to vaccine, it means something very different. It's why, actually, when the Autism Omnibus rulings came down, I was a little bit uncomfortable with the reaction that some vaccine advocates had, which was "this proves there's no connection." And my feeling is that it actually didn't prove anything! It had nothing to do with proof -- what you're trying to establish in a court of law and what you're trying to establish with science are not opposites and they're not connected -- but they're not the same thing. And regardless of what ruling had come down in the Omnibus cases, it didn't mean that the science had changed. What made me uncomfortable about those reactions, is that I think vaccine advocates should make sure they are in the position of saying "we support the science," and not "we support this other thing that is not directly connected to the science but which happens to support our position." Because I think that can be dangerous. What can we do to help families like the Cedillos, who were the lead petitioners in the Omnibus Autism Proceedings of June 2007 and pursued their petition in good faith but based on anti-vaccine beliefs and bad advice? That's something I almost feel like I didn't draw out enough in the book. One thing that's so tragic about the Cedillo case is that that is a family that would have received compensation if they had filed a table injury claim. Even though now after having gone through years and years of medical records and testimony, it appears that Michelle's condition was not causally connected to a vaccination event, she very very likely would have received compensation if she had filed a table injury claim. I don't think there's anyone who doesn't wish that family had more support. And that includes people working in the vaccine court, and working on the compensation fund. There are a lot of people working in the court and involved in administering the fund who just found the scenario to be absolutely heartbreaking, and I think you saw some of that in the Special Masters' opinion, which was much more emotional than you'd typically see, and he essentially said as much -- that this was a family who had been taken down a really unfortunate path. And what's interesting about that is that there are other vaccine court cases where families have been given compensation, and one of the things they exhibited was "autism-like symptoms" -- but that isn't the table injury claim that they made. To my mind, the Cedillo case is a very good example of why those other awards do not definitely mean that anyone is saying there is a connection between vaccines and autism. Could you define the difference between a Table Injury and what the Cedillos were trying to accomplish? Table injuries are a list of injuries that the court has already agreed could theoretically be caused by a specific vaccination, in a specific amount of time. Table injuries are things that have been established to the court's satisfaction to have occurred in the past. In the Cedillos' case, they were part of this Omnibus claim that was trying to establish autism as a table injury. So whereas for a table injury there is a very diminished burden of proof -- you don't need to show that the vaccine caused whatever the injury was, all you need to show is that both things happened -- both things being a vaccine and the injury. When you're trying to establish a new table injury, the process of doing that is first proving that that injury can be caused by giving vaccines. So to go back to the case of the pediatrician having a child having a febrile seizure right before a vaccination -- if the seizure had happened afterward, not only would the incident have been reported to VAERS, but that child could potentially have received some kind of reward -- because all you have to show is that the vaccine happened, and then the injury happened (though in that case, being a febrile seizure, there was likely no lasting damage). The larger point holds, though, that it's an example of the diminished burden of proof that's needed for table injuries. I think it also makes very clear something people tend to misunderstand, which is that NVICP awards are not the result of typical courtroom proceedings or rulings; it's nothing like a Law and Order episode. Yes, you're not using "beyond a reasonable" doubt, which is what you'd typically use in a typical court of law. The standard in the vaccine court is much, much lower. Do you think expectant parents could be better informed about vaccinations? I think a huge, huge shortcoming in our public health system is the way that information about vaccines is given to everyone, but especially expectant parents. I think that there is a disappointing amount of collaboration between the people involved in prenatal care, and the people involved in postnatal care. There's a real opportunity to start to have those conversations with expectant parents, and that's a time when parents are more able to take in and process information, and think things through. Speaking from my personal experience with both of our children, I kind of felt like I'd been hit by a Mack truck when they were born. I was not in a place where I could sit down and have a calm, measured conversations about the benefits and risks of vaccinations and why are we still vaccinating agains polio, etc., when I had a kid who hadn't slept in five days and spit up all down the front of my shirt. But if we'd had that conversation when my wife was five months pregnant, that was exactly when we had notebooks full of questions and information and plans and all of that. That is an area where there's a lot of work to be done, and I think the notion that the OB/GYN part of the equation is not responsible for what happens after the baby is born and therefore shouldn't get involved with those sorts of conversations is a deficient argument. Anything else you'd like to say about the book? One thing I try to remember to say is that the most important person to talk to is your doctor. One of the reasons I included 100 pages of end notes and citations and bibliography is that I didn't want readers to take anything I had to say on faith. I wanted them to be able to find out why I felt justified in saying that. So I hope my book can be used in a resource in that way -- but, again, the most important person to talk to is your pediatrician. I fully get how hard it can be to get your pediatrician to pay attention to your concerns outside scheduled ten minute wellness appointments. But I think parents actually have a responsibility in making sure their questions get addressed. One thing my wife and I started doing is when we had a question or concern that fell outside the purview of a typical appointment, is we would call in advance and make it clear before we got there that we wanted time outside of that fifteen minute appointment, so the doctor would know before we got there that we had other matters we wanted to discuss, and that it was not acceptable to tell us that there wasn't time. And that can be hard to do, to make demands; doctors are really busy and pediatricians more than anyone -- but I think parents really have a responsibility to do that, and to not just come out of an appointment feeling unsatisfied, and then decide that they're going to find those answers from their friend or their neighbor.